Short Business Description: Claudia offers permaculture design with a focus on edible and natural landscapes, site consultations and workshops. 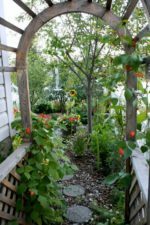 Claudia Bolli of Wild Green Garden Consulting offers permaculture design with a focus on edible and natural landscapes, site consultations and workshops. Claudia is a nature lover, gardener and teacher. Her education includes a Diploma in Biological Sciences, a Permaculture Design Certificate, Organic Master Gardener and Master Naturalist training, and workshops and hands-on work with The Urban Farmer. Kenton Zerbin is an inspirational speaker, teacher & consultant who empowers others to repair degraded landscapes, grow food and build community. A government teacher by training, Kenton specialty now is in facilitating a quality education as a professionally certified Permaculture teacher. He has spent several years studying, designing and teaching Permaculture across Australia, Canada, the U.S. and the Caribbean. He has designed multiple properties, started a Permaculture Research Institute in Barbados, and been a guest speaker for gardening groups, education conferences and Universities alike. Kenton now resides and teaches in central Alberta. Michael Victoria Moore is a permaculture designer, painter, sculptor and community organizer. She is the owner of Genesis Permaculture, Landscaping and Regenerative Design, a permaculture design/consulting business operating in Alberta. Michael conducts both rural and urban site development consultations throughout Alberta. As a teacher, she has facilitated numerous workshops and courses on rainwater harvesting, food forestry, micro-climates, soil microbiology, and regenerative living. Food Forest & Community garden design and implementation – Ermineskin Cree Nation, central Alberta. Grow food not lawns with Spruce Permaculture this season! Spruce Permaculture is an urban food consulting and permaculture landscaping company based in Edmonton, Alberta. It is our vision to help households produce more of their own food sustainably and to design regenerative home systems for food, water, waste and soil that blend beauty and productivity. We offer comprehensive Permaculture landscaping consultations, mentorship, education, design and installation services in-house. We design and manage indoor food systems such as hydroponics, aeroponics and aquaponics. We teach sessions and workshops on vermicomposting, food forestry, indoor agriculture and more. We also work with MacEwan university to manage and develop their on-campus hydroponic, aeroponic and aquaponic food production systems. Sustainability Consulting and landscape design. On-site consultations which will save you time and money! Full landscape design services as well as complete installations of landscape projects. Do it yourself guidance and project management. We can help you to create your own design or build your landscape. Our experience and expertise will ensure a successful completion and avoid costly mistakes. Talks and workshops tailored to your needs. The founder of Earth Legacy Inc. Arinna Grittani, is dedicated to saving the planet and has chosen the field of landscaping and permaculture as her way of making a difference. She has been in the landscaping field since 2002 and has completed the Landscape Architectural Technology diploma program at NAIT. She has completed a PDC in Mexico with Andrew Jones and Penny Livingston, and another in Edmonton with Ron Berezan and Javan Bernakevitch. She also has extensive knowledge of sustainable systems and technology and has connections to experts in these fields. The Earth Legacy team has other very talented designers from the NAIT program as well as a PhD biologist and organic gardener with over 30 years’ experience. Nature’s design provides eco-friendly lawn clean up, permaculture design, and design installation services. Sarah has over 24 years’ of experience in construction, specializing in Project Planning for the last eight. She also has a Permaculture Design Certificate and over four year’s experience growing organic produce on her urban lot. She is dedicated to educating others on how to live a healthier, more sustainable and compassionate lifestyle.